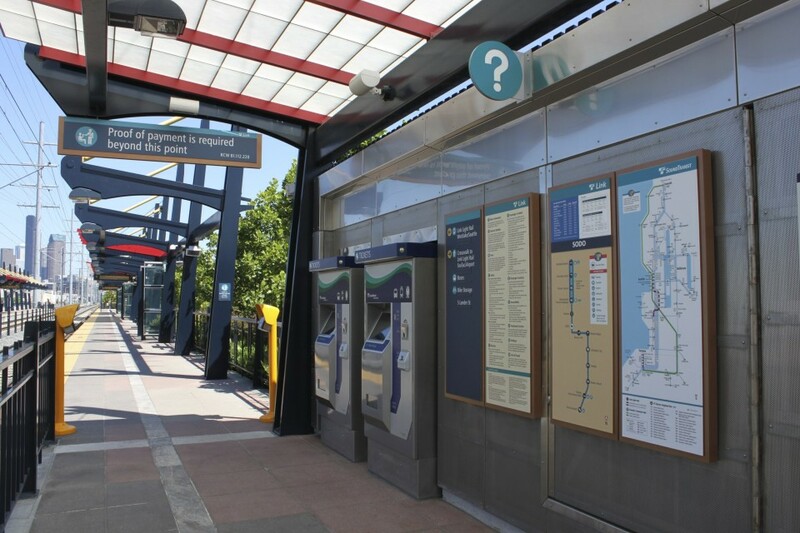 Every transit stop must include information about routes served at the stop in a clear, legible manner. 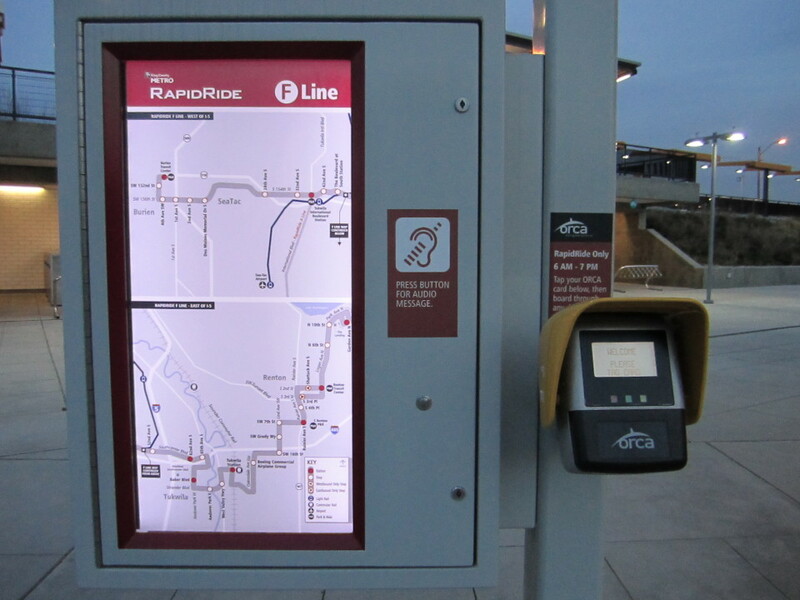 Providing clear and simple information like route and system maps, schedules, expected travel times, real-time arrival times, and ridership procedures makes the system more attractive and simpler to use, and improves rider satisfaction. Additionally, good information can enhance the transit stop as a gateway to its surrounding neighborhood or destinations. Maps, routes, and other wayfinding should be prominent at stations and stops, especially high-volume, high-activity, or transfer stops. System information may include strip maps of single routes, fixed schedules or frequencies, full system maps, and pertinent transfer maps or schedules. Information can be shown on hanging signs or signage integrated into the shelter. Temporary posted information should be protected from weather behind placards. 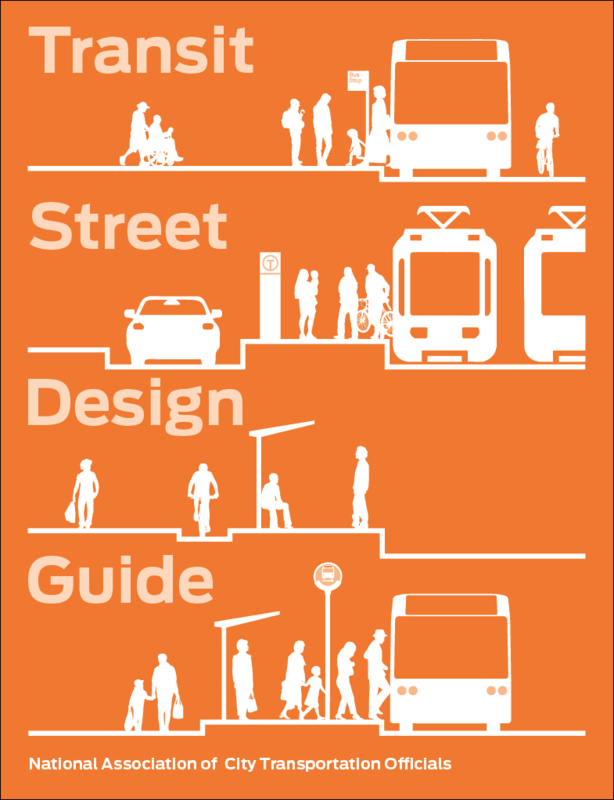 Outside of stations, wayfinding materials guide rider decision making and transit access. Where bus routes run on one-way streets, or where the location of the stop in the opposite direction is not obvious, wayfinding signage should indicate its location. Providing route information that is clear, understandable, and accurate makes it easier for passengers to understand their travel options. Wayfinding signage makes it easier to find bus stops, especially where stops for opposing travel directions are not located immediately nearby each other. Alerting riders about nearby, transit-accessible destinations enables them to make more informed decisions about their travel options. Schedule and real-time arrival information reduce uncertainty and improve rider satisfaction. Rider surveys in Tampa found that 70% of riders feel more satisfied with transit service since they began using a real-time arrival mobile app. 60% of riders in Atlanta reported improved satisfaction, and 71% reported spending less time waiting for transit. Candace Brakewood. Evaluating the Impacts of Real-Time Transit Information in Tampa and Atlanta. USF Center for Urban Transportation Research (2014). Stops and stations are gateways to their destinations, and wayfinding can highlight key destinations. Concise signage and tactile cues can assist transit users in navigating unfamiliar surroundings or novel transit use conditions. Level of detail for information displayed must be carefully considered to provide clarity and avoid confusion. Avoid over-signing, or cluttering the station area with too much information which may be ignored or contribute to information overload. Listing key information about route frequency, running times throughout the week, and accessible destinations allows riders to make well-informed decisions about travel and routes. Simple network structures and rider procedures can be inherently easier to understand and may require less instruction. Apply universal design principles to passenger information and wayfinding elements, including audible and tactile resources. Each stop shall include a stop name or identifier (destination/cross street, or numbered/lettered identifier); route identification; network and route map; schedule and route information; and clear indication of stop location and position. 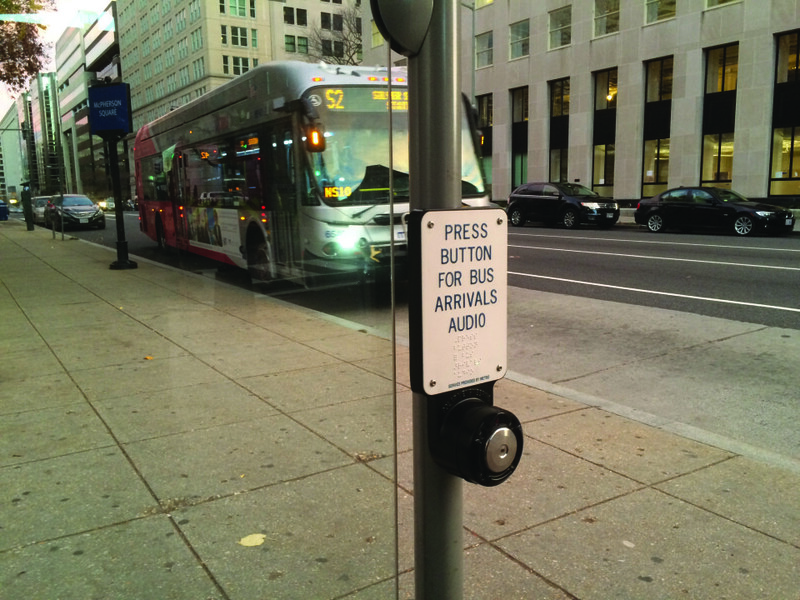 Bus route identification signs must comply with accessibility requirements. Bus stop signs must adhere to ADA sign and display design requirements, including visual contrast, glare, appropriate character size and spacing, and iconography. However, schedules, timetables, and system maps are exempted. “810.4 Bus Signs.” 2010 ADA Standards for Accessible Design. US Access Board, United States Department of Justice (2010). For riders with visual disabilities, provide an alternative to visual display boards; audible announcements are preferred over braille and other methods that require finding the display. Consider station/street noise and environmental characteristics during implementation. If at an intersection, signs identifying stop location must be visible from all corners with either a recognizable system logo or standard transit stop marker. Use wayfinding signage and materials that are consistent with regional or agency brand; consistent use of logos, colors, and fonts reinforces visibility. Place wayfinding in predictable locations, such as overhead or at eye-level, and at regular intervals. Place wayfinding elements at progressive intervals, and disclose necessary information at decision points. Name stops, stations, and destinations to reinforce brand and recognizability. Where multiple stops are located in close proximity to each other, mark stops with letters or numbers to ease stop identification and facilitate transfers (see On-Street Terminal, page <?>). Signs identifying a stop name, location, or identifier must be prominent enough to be seen by passengers riding inside a transit vehicle, to aid in stop identification. Real-time arrival displays with mobile app integration improve rider satisfaction and can increase ridership. 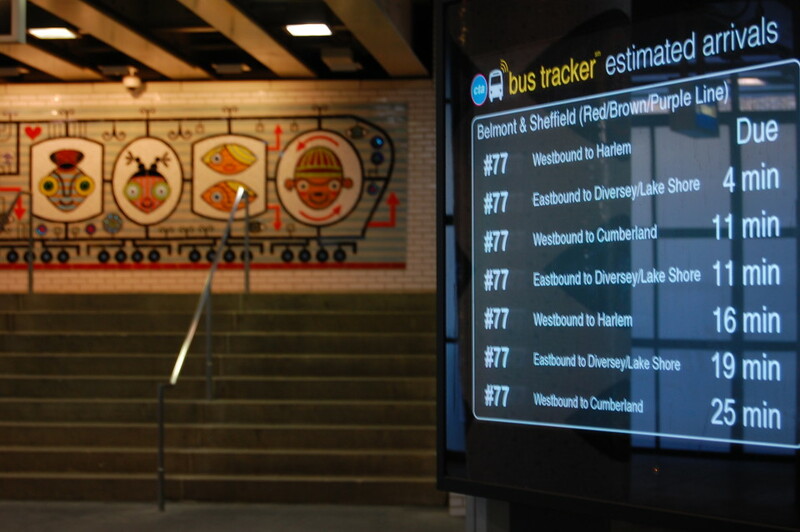 Real-time displays can range from simple one-color LED text to full-resolution screens, and should be accompanied by audible announcements. Integrate route and real-time arrival information into mobile applications, with emphasis on applications usable by people with visual disabilities. Providing information in these formats can strongly complement the written, visual and audio information present at a stop. Include relevant transportation connections and services, including regional routes and bike share stations, to expand rider options. To direct riders to from stations to destinations in the station area, indicate travel direction and times in easily understood units, such as approximate walking time. Paving materials may indicate direction to subtly guide users through transit facilities. Platforms may indicate door boarding areas with detectable surfaces, on-platform markings, or signage (i.e. “Wait Here,” “Step Aside,” etc.). References for Passenger Information & Wayfinding: 1 found. Fan, Yingling, Andrew Guthrie, and David Levinson. "Perception of Waiting Time at Transit Stops and Stations." Working paper, University of Minnesota, Minneapolis.